→Is Using Iodine Safe for your Thyroid? Iodine is a trace element which your body requires in order to manufacture thyroid hormone. Without iodine, your body is not able to produce thyroid hormone and you will develop hypothyroidism. While it may be tempting to run out and use iodine I would caution against that action without reading this information first! In some cases, using high doses of iodine can be dangerous (1) and that's exactly what we are going to discuss here. Iodine is a hotly debated topic due to a variety of reasons. The only way we humans get iodine is through our food. Iodine can either be acquired by consuming naturally occurring iodine in foods such as seaweed or it can be taken in foods which have been iodized (such as salt). This sets up a scenario in which it's relatively easy to become deficient. How often are you consuming seaweed or kelp? And are you actually using iodized salt? Celtic sea salt and Himalayan pink salt typically do not contain iodine. The second reason has to do with a perfect storm of scenarios that have collided to create our current situation. The current paradigm of thyroid treatment focuses largely on lab tests and not on individual patients. This paradigm has resulted in many patients which feel like they are not being heard or treated appropriately. Simultaneously, we also have evidence that many people are iodine deficient which is a known cause of thyroid dysfunction. It's easy to see why these patients, who are not being treated adequately by their current doctors, turn to iodine as a potential source of treatment for their thyroid problems. This has set the stage for different strategies and opinions about how to properly use iodine and anecdotal evidence that the use of iodine can cure thyroid-related problems. And, finally, there are further issues regarding the 'source' and 'purity' of various sources of iodine. Back in 2011, there was a nuclear reactor leak from an earthquake in Fukushima (2). This caused nuclear waste leakage and the concern that naturally occurring sources of iodine from seaweed an kelp were contaminated. In addition, there's also concern that seaweed and kelp naturally accumulate heavy metals and other materials which have been dumped into the ocean. The concern is that people who consume their iodine and kelp may be causing more harm than good to their body because of these reasons. We are going to attempt to tackle many of these issues and really talk about whether or not it is safe to consume iodine. Is it actually safe to consume iodine? There are advocates on the internet who suggest that consuming many times the average recommended dose is actually not only safe but effective in treating thyroid dysfunction. I'm going to discuss several reasons why that may not be a good idea. We know that iodine is essential to thyroid function, but we also know that too much of a good thing can cause issues. 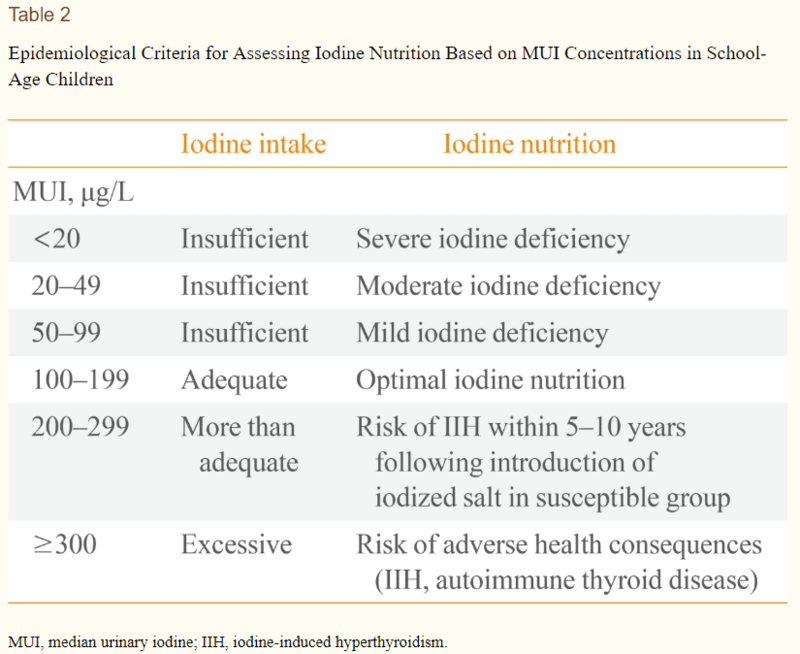 If you are considering using high dose iodine I would suggest you take a look at these conditions prior to doing so. Perhaps the most concerning problem is that of thyroid cancer. Some studies have shown that iodized salt prophylaxis (adding iodine to salt) was associated with an increased risk of cancer afterward. Now, this doesn't necessarily mean that iodine consumption is causing thyroid cancer, but it is still something worth considering. This data comes from Australia and dates back to the 1960's. Around that time period, Australia increased iodine supplementation in certain areas of the population. They found that 20 years later the rate of thyroid cancer had increased from 3 in every 100,000 to 8 every 100,000 patients (3). Again, just because the rate increased over this time period doesn't necessarily mean it was due to the iodine supplementation. It could have also been due to an increase in thyroid cancer awareness or due to new imaging techniques (finding the cancer earlier). But, to support the idea that there is a connection between iodine intake and thyroid cancer other studies have shown similar findings. A similar event occurred in Sweden which found that higher iodine intake was associated with a higher incidence of thyroid cancer (4). Another big problem that we must deal with is the increasing rate of autoimmune thyroiditis. Autoimmune thyroiditis (such as Hashimoto's thyroiditis) is a condition in which your own immune system attacks and destroys your thyroid gland over a period of time. Many studies have shown that the risk of developing autoimmune thyroiditis increases with iodine intake. This information comes from a study in Poland where researchers found that the rate of autoimmune thyroiditis increased from 1.5% to 5.7% over a 7 year period (5). I don't think it's necessarily true that iodine results in autoimmune thyroiditis development but more likely that it exacerbates underlying conditions which further the expression of the disease. It means that certain people who would have likely developed Hashimoto's at some point in their life had an acceleration of the disease process due to isolated iodine supplementation. Adult bodies are supposed to be able to handle temporary high doses of iodine excess due to some protective mechanisms which exist in the body. As you take high doses of iodine, your body reacts by blocking the uptake of iodine into the thyroid gland. This mechanism exists to prevent the production of excess thyroid hormone. But this mechanism doesn't exist for the fetus. Studies have shown that the fetal thyroid does not have the same ability to block iodine uptake when compared to the mother (6). This means that using high doses of iodine while you are pregnant may result in fetal hyperthyroidism. Studies have shown that using iodine during pregnancy results in changes in TSH levels of cord blood compared to women who do not supplement. Having said all of this, we also know that pregnant and lactating women require higher amounts of iodine during pregnancy. 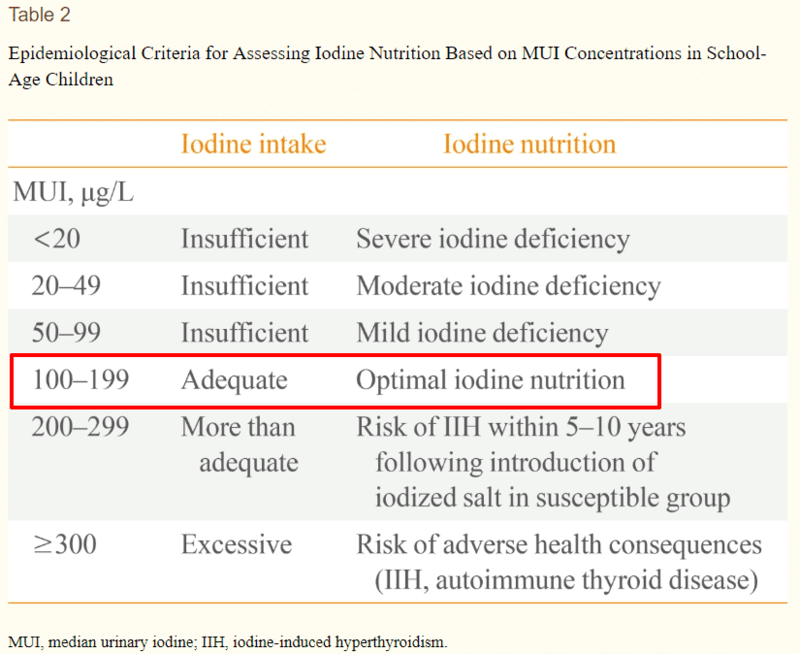 It may be wise to use a slightly higher amount of iodine while pregnant while avoiding excessively high doses of iodine. Your thyroid requires about 150mcg of iodine per day to produce thyroid hormone. If you don't get this amount your thyroid may enlarge which causes thyroid goiter. In some situations, providing a sudden increase in iodine can actually result in the excess production of thyroid hormone from your gland (7). This can flood your system and may result in a condition known as hyperthyroidism. Hyperthyroidism is the exact opposite of hypothyroidism where your body produces too much thyroid hormone. While this condition doesn't happen all the time, there is a risk that it may occur in certain populations of people. People in iodine-sufficient areas (such as the United States) who suddenly take excessive doses of iodine (more than they need). People who have previously had episodes of postpartum thyroiditis in their life who suddenly take high doses of iodine. People who have thyroid goiter who suddenly take large doses of iodine. People who have Graves' disease who are taking anti-thyroid drugs. This group is prone to developing iodine-induced hyperthyroidism if they take iodine. In addition, using high doses of iodine may reduce the effectiveness of anti-thyroid medications. I think part of the problem with iodine supplementation is that no two cases are exactly identical. It's possible for some people to take as high as 50mg of iodine per day and not experience any issues, but if you fit any of the conditions listed above then that dose of iodine can actually trigger serious problems. Be wary of people and providers who recommend, without hesitation, large doses of iodine universally. There is obviously a large range of iodine that you can consume. Some over the counter supplements contain around 100mcg per day while other supplements contain up to 12.5mg per dose. When you consider that 1,000mcg is equal to 1 milligram it's easy to see the difference in potency. Some over the counter iodine supplements contain more than 100 times the daily recommended dose. This makes it very easy to accidentally overdose on iodine which makes it very easy to cause problems and toxicity. This image includes the various ranges of iodine intake and how they relate to whether it is a sufficient amount for your body. Notice that the dosages are in the MCG (microgram) range and not the milligram range. Per this chart, an excessive amount of iodine is classified as more than 300mcg taken per day. The adequate range is defined as 100-200mcg per day. When you take into iodine intake, it's important to realize that your body has the capacity to store a certain amount of iodine in both your thyroid and other tissues. So, it may be necessary to take higher than normal amounts of iodine temporarily to replete this store if you are deficient for a period of time. If you go 6 months consuming less than 20mcg of iodine per day you may run the risk of depleting the iodine storage in your body. In this case, it wouldn't be enough for you to consume 100mcg per day because this wouldn't allow for you to both utilize iodine and replete your storage. Instead, you may need to temporarily consume 300mcg or more per day for a set period of time. I find that most people do well when supplementing between the 100 to 200mcg range per day and this range will keep you out of the excessive dose and reduce your risk of negative consequences. Does all of this mean that you should avoid using iodine at all? No, not at all, and that's not what I'm trying to say. Instead, my recommendation for using iodine is to use only enough to meet your needs and to slowly titrate up (increase your dose) only if necessary at that point. According to several studies, and my own personal experience in treating patients, I believe that using around 50 to 150mcg per day is a very safe range. That's why I put no more than 75mcg of Iodine in my T3 conversion booster. So, how should you proceed if you want to try using an iodine supplement? I recommend starting out in the 50 to 150mcg range. To get there you may need to use a small supplement (not a highly concentrated supplement such as Lugol's solution). There is a lot of fear out there regarding nuclear contamination of kelp and seaweed from the nuclear leak at Fukushima. I've found that this fear is largely unfounded considering recent studies show that the vast majority of that radiation would have been cleared a few years after the leak (8). Another concern some people have is of heavy metals. But, again, recent studies show that the levels of heavy metals in seaweed and kelp are very minor (9) and not in sufficient quantity to cause problems. You should, therefore, be fine using iodine from seaweed (by eating it) or using supplements which contain iodine from seaweed. If you also have T4 to T3 conversion issues then I would consider using a supplement which contains other ingredients such as Zinc and Selenium which can also be thyroid protective. While iodine is an essential nutrient required for thyroid function it is not something that you should consume in incredibly high amounts. Contrary to popular belief on the internet, high iodine intake has been associated with an increased risk of several conditions including autoimmune thyroiditis, thyroid cancer, and hypothyroidism. While it may be true that some people can tolerate incredibly large doses of iodine that doesn't mean that all people can or that all people should even consider doing so. In my experience, using an appropriate amount of iodine is sufficient to replete iodine levels in the body and maximize thyroid function. Using high doses of iodine may be tempting if you believe that you can 'reverse' your thyroid condition, but it may actually cause the opposite. When in doubt, make sure you look to the clinical studies as a guide (not anecdotal evidence). Have you used high doses of iodine? Are you considering supplementing with iodine? What thyroid problems are you suffering from?